The Xbox One is out on November 22, and we know almost everything there is to know about Microsoft's new console. For your convenience, we're rounding up all of that information and putting it right here. As we continue to learn more about the Xbox 360's successor, we'll keep updating this post, so check back over the next few months to make sure you're totally caught up with all of the next-gen news. Update (10/17): We're just a month away from release, and we know quite a bit about the Xbox One so far. This post has been updated with more information on release dates, dedicated servers, and other tidbits about Microsoft's next console. Update (8/20): Today at the GamesCom conference in Germany, Microsoft announced 23 games slated to be available with the launch of the console in November and delivered the first details on its ID@Xbox indie developer program. This post has also been updated to reflect recent changes in the console's Kinect requirements. Iterating on the Xbox 360's controller, the Xbox One controller is very similar to its predecessor, albeit a bit wider. In the middle, replacing the 360's Back and Start buttons, are new buttons called Menu and View. The back-trigger rumble is way improved, by all accounts, and each trigger can rumble separately thanks to two new rotors in the controller. And then there's this creepy tidbit, via Microsoft: "An infrared LED on the front of the controller allows Kinect to automatically recognize you, making it easier to pick up and play." YOUR CONTROLLER WILL KNOW WHO YOU ARE. Pre-ordered versions of the Xbox One will come with a special branded controller that says "Day One 2013." Microsoft says this controller is sturdier and more comfortable. You'll still have to use AA batteries or a recharge pack to keep it running, and it'll be compatible with PCs, but not until next year. November 22 for 13 countries: Australia, Austria, Brazil, Canada, France, Germany, Ireland, Italy, Mexico, Spain, United Kingdom, the United States and New Zealand. Some sort of Halo, because of course. Sunset Overdrive, a colorful shooter by Insomniac, the folks behind Ratchet & Clank. Forza Motorsport 5. vroom vroom. Some other games, like Harmonix's Fantasia and Respawn's Titanfall, will be available for both Xbox 360 and Xbox One (and in Titanfall's case, PC as well). The open-world game Watch Dogs was originally on the list, until Ubisoft delayed it to spring 2014. Worth noting: all games must be installed before you can play them. This one's a doozy. For a month or so, Microsoft was all about a digital Xbox One: you'd have to connect to the Internet once every 24 hours to play games, for example, even to play them offline. Used games would also be restricted heavily. Then came the reversal: in late June, after intense backlash and criticism, Microsoft announced that they had changed their minds. Total 180. No more crazy DRM policies. So, long story short: you'll need to connect to the Internet at least once before you can play games on the Xbox One, but after that one-time patch, it'll work just like the 360 did. You'll be able to play offline. You'll be able to buy and sell games just like you can today. Also thanks to the big reversal, there is now no region-locking. Microsoft now says the Xbox One is totally region-free. It includes a 1080p, HD camera that captures video at 30 frames per second. All new, active-infrared capabilities increase precision, allowing it to work in nearly any lighting condition and expanding field of view to accommodate a greater variety of room sizes. Microsoft proprietary Time-of-Flight technology measures the time it takes individual photons to rebound off you to create unprecedented accuracy and precision. The new noise-isolating multimicrophone array filters ambient sounds to recognize natural speaking voices even in crowded rooms. While Microsoft originally indicated the Xbox One would require a Kinect to function, they later revealed that is not the case, though the system will not be sold without one. Worried about the privacy implications of having a device like that in your living room? Microsoft says you'll be able to turn it off, although the details are still a bit hazy. 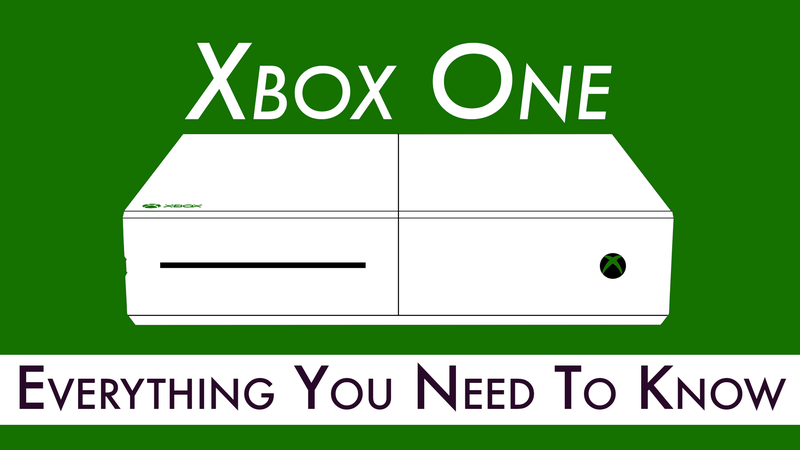 You're never gonna believe this, but the Xbox One ain't just for playing games. Microsoft wants it to be a home entertainment system. I know—I'm shocked too. Use Snap to do two things at once. Talk to friends on Skype, and watch the big game together. Follow what people are saying about your favorite show by surfing the Web. Listen to the music of your choice while playing the latest blockbuster game. Jump back and forth instantly between experiences without a loss in performance. So you can Skype while watching a movie, check your fantasy scores during a football game, and so forth. Multitasking: it's the future! Microsoft's online service has always had a bit of a reputation for being infested with obscene thirteen-year-olds, and now the Xbox makers are going to do something about it: with their new Reputation system, players will be held accountable for what they say online. Getting muted or banned during games will cost you reputation points, and players will be matched online based on their reputations. Also, more friends! The friend cap on Xbox Live is now 1,000. You'll be able to use your real name to identify yourself on Xbox Live instead of your gamertag, but not until they enable the feature after launch. Xbox One has a whole new system in place for Achievements: in addition to basic cheevos, developers will be able to give you Challenges, or timed events like, say, "a headshot weekend challenge that requires players to cumulatively headshot 1 million baddies in a 3 day period. And every person who participates and meets the challenge’s goals gets the unlock on his or her achievement history and reaps its reward." Xbox Achievements Are Changing. Here&apos;s How. Achievements will also be far more malleable thanks to Microsoft's cloud servers, and insanely enough, you'll also be able to earn achievements by watching videos or listening to music through your Xbox One. It's a much bigger system. Microsoft says they'll offer dedicated servers for all games, totally free—in other words, when you play a multiplayer game online, you won't have to pick someone to host it, therefore giving that person a split-second advantage. With dedicated servers, everyone's on neutral ground. This is welcome news for anyone who plays shooters or other games in which half a second can mean the difference between victory and defeat. The Xbox One is not backwards compatible. "If you’re backwards compatible, you’re really backwards," ex-Xbox boss Don Mattrick told the Wall Street Journal back in May. Your gamertag and gamerscore can transfer over from the Xbox 360. You'll be able to record and edit gameplay footage on your Xbox One, then upload it online. You'll also be able to stream yourself playing games on Twitch. The system will automatically record the last five minutes of gameplay as you use it. The HDMI-in feature is unusual for a console, and it could lead to some interesting possibilities: since you can plug a cable box or even other consoles (like, say, the PS4) into your Xbox One, you can hypothetically play around with the multitasking Snap feature in all sorts of ways. Should be interesting to see what they do with this. You can use standard video capture devices on Xbox One, just like you could on the 360. No more Microsoft Points! Finally. Although the "family sharing" plan originally announced in May is no longer a confirmed feature, Microsoft's Marc Whitten has hinted that it could come back in some form. Microsoft is all about cloud processing—or processing that can be performed on their servers, theoretically lightening the load for your console and allowing for more impressive games than would be possible with the Xbox One's processing power alone. It's all theoretical for now, though. Many developers are using Microsoft's "SmartGlass" technology to allow you to use your phone or tablet as an accessory for games. In Dead Rising 3, for example, you can use a mobile device to call in airstrikes to blow up zombies all around you. The controllers are designed not to shatter when thrown, won't have smell-emitters (a failed experiment, thank goodness) and will work with PCs starting some time next year. At Gamescom 2013, Microsoft officially announced the ID@Xbox Independent Developers publishing program for Xbox One. Initially limited to a select group of indie developers, eventually the program will open up to anyone with an Xbox One, giving them full access to all of the console's advanced features, including Kinect and Smart Glass. You can upgrade some of this fall's current-gen games (Battlefield 4, Call of Duty: Ghosts, etc.) to next-gen games for a small fee. Single-player progress won't carry over, but multi-player progress will. Don't stand your Xbox One vertically. "Do it at your own risk," Microsoft says. The Xbox One will be out on November 22.